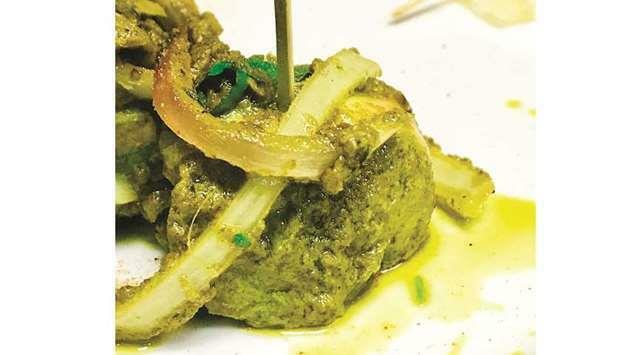 (MENAFN - Gulf Times) With winter season receding and days becoming longer, the weather is perfect to cook some tikkas, kebabs and outdoor barbecue. Mankind's love for freshly grilled meats will never fade away and it is always an interesting way to indulge in family time over weekends or a perfect sea-side get together. To enjoy grilled meats, the marinate plays an important part in the success of a perfectly grilled meat. The marinate should complement the meat and should not drip out while you are cooking it over fire. There are so many different marinades that you can choose to marinate your meats but there is always a scope for trying different marinades to your meats and make them more interesting and refreshing. One such marinade is hariyali which is made with mint and cilantro and yoghurt. The green coloured marinade gives a nice green colour to the dishes and is delicious. Hariyali chicken tikka is a mouthwatering appetiser recipe and is quite poplar in Northern India and best enjoyed with some exotic dips. This non-vegetarian recipe is prepared with juicy chicken breasts marinated in a blended mixture of mint leaves, coriander leaves, mint leaves along with a mélange of flavoursome spices. This recipe is easy to make at home and this appetiser would be loved by everyone in your house. One can serve this appetiser on occasions like get together, parties, birthday parties or kitty parties. For vegetarians just replace the chicken with your choice of vegetable or fruits like broccoli, baby corn, mushrooms, pineapple, paneer cheese and make your own vegetarian version of hariyali tikka. Adding fresh and healthy ingredients like mint and cilantro have their own unique benefits. Mint is the highlight of this recipe and the final dish has a prominent mint flavour. Mint has many health benefits too. Mint has the answer to almost all your digestive problems. It helps digest food easily. Menthol is the oil in mint which has antibacterial and antiseptic properties and helps soothe an upset stomach. Mint is loaded with anti-inflammatory properties and helps relive nasal congestion and relieves in asthma. The strong refreshing aroma of mint relieves headache. Mint oil-based balms are efficient in treating headache. Mint has long been used as breath freshener. Chewing the mint tablet or leaves helps freshen your breath instantly. Mint can also play its own sweet role in your weight loss regime. The reason is tied to its much-tamed digestive properties. Mint stimulates the digestive enzyme which helps in better absorption of nutrients from food. When the body can absorb better nutrients in the body there is better metabolism and faster metabolism aids weight loss. I strongly believe that knowing more about your food ingredients helps us to co-relate your health goals and include healthy ingredients in your diet and lead healthy eating habits. Wash and clean the chicken breast and pat dry to remove excess moisture. Cut the chicken breast into 1-inch cubes and set aside. Place the yoghurt in a fine strainer and let the water drain out, keep it in refrigerator for 3-4 hours or preferably overnight. In a kitchen blender combine washed cilantro leaves, mint leaves and green chili and blend to get a fine paste adding very little water. In a clean mixing bowl, transfer the chicken, prepared green masala and yoghurt and the remaining spices. Combine well to coat the chicken evenly, leave covered in a refrigerator for 2-3 hours to allow the chicken to marinate. Preheat the oven and skewer the chicken pieces and cook over a dripping tray at 180 degrees Celsius for 20-25 minutes or till you get the internal temperature to 75 Degree Celsius. When the chicken is almost half cooked, drizzle it with clarified butter to keep it moist and juicy. Allow the chicken to stand for 2 minutes and serve hot sprinkled with chat masala and lemon wedge and thin sliced red onion on the side. Note: You can use Greek yoghurt instead of the hung yoghurt to save time. Also, instead of cooking the chicken in oven you can skewer it over BBQ grill too. It is important to extract all the water from the chicken and use very little water to grind the mint paste as excess moisture won't allow the marinade to stick to the chicken while cooking.